BBC NEWS | UK | UK Politics | Why is Blair backing nuclear? 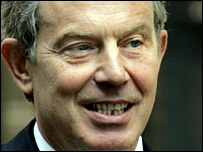 Why is Blair backing nuclear? So far this week the prime minister has whipped up controversies over the criminal justice system, animal rights protesters and, perhaps the most explosive, nuclear power. It almost appears that he is determined to get as many people up in arms over his policies as he can humanly manage - surely madness? But many in Westminster believe they see a method behind this apparently deliberate storm-chasing. They simply believe he is engaged in a classic Alastair Campbell-style attempt to deflect attention away from his own leadership troubles, seize back the political agenda and inject some forward momentum into the government. It is certainly the case that all these issues dominated the headlines on the days he chose to highlight them. For example, his remarks about the likely need for new nuclear power stations - which were, in fact, only a re-statement of his long-held position - came on the same day the cash-for-peerages affair took another twist and a new immigration row erupted. It has also been pointed out that early briefings from Downing Street on what was going to be in his speech made no mention of energy policy and that Mr Blair appears to have rushed forward debate on the policy several weeks before originally intended. But, as far as nuclear energy is concerned at least, there is another side to this, other than providing a useful diversion. What the prime minister appears to have been doing since before the general election is preparing the ground for what will inevitably be a hugely difficult and controversial decision, when it comes. 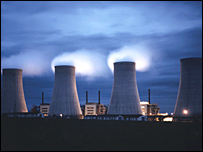 So the prospect of a return to nuclear power was included in the last election manifesto, the prime minister's 2005 conference speech and most notably, his remarks to the CBI last year which was disrupted by Greenpeace protesters and at which he used virtually identical words on the issue being back "with a vengeance". It has also been noted that ministers believed to be against nuclear power, including Margaret Beckett, and Elliot Morley have either been moved from departments directly concerned with energy or, in Mr Morley's case, sacked. Mr Morley has repeated his opposition, saying the private sector was not willing to invest in nuclear and that "economically, the risks are great and the returns are low". The ministers now in charge of developing the policy, David Miliband and Malcolm Wicks in the department of trade - also the department carrying out the energy review - are believed to be in favour. And now the prime minister is helpfully producing a "dossier" of facts and figures on the Downing Street website setting out just why we have to embrace nuclear power. But if the prime minister has made up his mind in favour of nuclear, as critics claim, and is attempting to gradually win over the country there will still be a long hard battle ahead. But this is one battle the prime minister appears eager to engage in.